In this video, Amazon's Ranju Das demonstrates real-time facial recognition to an audience. It shows video from a traffic cam that he said was provided by the city of Orlando, where police have been trying the technology out. Tech companies are trying to sell police real-time facial recognition systems, which can track and identify people as they walk down the street. As NPR reported two weeks ago, American police have generally held off, but there's new evidence that one police department — Orlando, Fla. — has decided to try it out. What's more, Orlando ordered its facial recognition system from Amazon. This information was uncovered by the ACLU, which noticed that law enforcement customers were mentioned in the marketing of Amazon's "Rekognition" service. Until now, American police have used facial recognition primarily to compare still photos from crime scenes with mug shots. But now Amazon and Orlando are taking it further, by using facial recognition to spot people in real time. "City of Orlando is a launch partner of ours," Amazon's Ranju Das recently told a developer conference in Seoul, South Korea. "They have cameras all over the city. The authorized cameras are then streaming the data ... we are a subscriber to the stream, we analyze the video in real time, search against the collection of faces they have." In this video presentation, Das is seen saying the system can be set up to notify the city if cameras see a "person of interest," and it could be used to reconstruct a person's past movements. He showed the conference a demo of real-time facial recognition using video from a "traffic cam that was provided by the city of Orlando." In a written statement, the Orlando Police Department called the Amazon facial recognition system a "pilot program" and said it "will be used in accordance with current and applicable law." The statement also says the department "is not using the technology in an investigative capacity or in any public spaces at this time." It did not say whether the system has been used that way in the past, or will be in the future. NPR tried to follow up, but OPD said it wasn't doing interviews on the topic. In a later statement, after NPR's story was first published, the department said the pilot was "limited to only 8 City-owned cameras" and a "handful" of officers who had volunteered to participate. It said the OPD was not "utilizing any images of members of the public for testing," and that the partnership with Amazon was "to see if the technology even works." Amazon also wouldn't do an interview with NPR. In a written statement, it pointed out that its visual analytics tools have a wide range of applications beyond policing, and that "[o]ur quality of life would be much worse today if we outlawed new technology because some people could choose to abuse the technology. Imagine if customers couldn't buy a computer because it was possible to use that computer for illegal purposes?" Amazon's statement added, "[W]e require our customers to comply with the law and be responsible when using Amazon Rekognition." There are no laws explicitly barring law enforcement from using real-time facial recognition, and the constitutionality has not been tested by higher courts. Matt Cagle of the ACLU of Northern California says he's disturbed by what he sees as a lack of transparency and public engagement, as police and tech companies work together to bring this new tool to American streets. "Amazon is handing governments a surveillance system primed for abuse," Cagle says. "And that's why we're blowing the whistle right now." The ACLU filed public records requests for Amazon's communications with Orlando and another Rekognition customer, the Washington County Sheriff's Office, near Portland, Ore. Cagle says the resulting documents show a company eager to push law enforcement customers toward real-time facial recognition and connect it to other devices, such as officer body cameras. This is typical of companies that sell facial recognition. Most try to encourage customers to expand the applications and powers of the technology. What makes Amazon's offering different is the price. "We pay literally a couple of dollars a month to do this service," says Washington County Sheriff's Office spokesman Deputy Jeff Talbot. His department uses Amazon's Rekognition to scan faces in photos of suspects taken by deputies in the field. "They've created a little tool where you upload and it sends you your results and you can continue your investigation," he says. In the past, police departments had to pay tens of thousands of dollars for facial recognition systems, provided by traditional vendors such as NEC. Now Amazon is offering police something similar for a fraction. The Washington County Sheriff's Office says it does not use Rekognition in real time and doesn't intend to. Cagle says that could easily change. The marketing of Rekognition to law enforcement is still in its infancy, but he's worried it could quickly become dominant, given Amazon's market clout as the world's leading cloud services company. "Activating a real-time facial recognition system, that can track people, if the technology is there, could be as simple as flipping a switch in some communities," Cagle says. An update now on a story we brought you a couple of weeks ago about facial recognition technology. NPR's Martin Kaste reported that American police have been reluctant to adopt, quote, "real-time systems," the kind that ID people as they walk down the street. Now Martin says it appears at least one police department is trying that out with the help of a very familiar tech company. MARTIN KASTE, BYLINE: Believe it or not, that company is Amazon. It sells a video analytics tool called Rekognition. It's cloud-based. You upload video along with the faces that you want it to scan for. Anybody can use it, but recently the company started pitching it to local governments. RANJU DAS: City of Orlando is a launch partner of ours. It's a smart city. They have cameras all over the city. KASTE: This is Amazon employee Ranju Das talking up the product's public safety uses at a recent conference. DAS: We analyze that video in real time, search against the collection of faces that they have. These could be their mayor if they want to know if the mayor of the city is in a place, they want to know if - persons of interest they want to track. 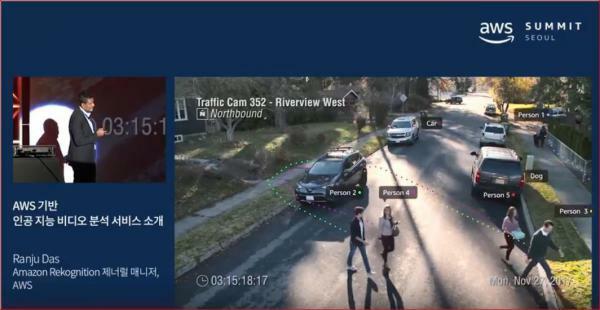 KASTE: That sounds like the real-time systems that police in China have been bragging about recently - networks of cameras that let them track where someone is or has been. American police have not had this ability yet as far as it's been documented, and the privacy laws here are not clear about whether the police would need a warrant to do this kind of scanning. In a written statement, Orlando Police called this a pilot program but would not take follow-up questions. Later, after the web version of this story was published, they sent another statement saying real-time facial recognition have been tested on only eight cameras in the city and did not involve the identification of members of the general public. The department has not explained its future plans for the system. MATT CAGLE: We're talking about a new technology that supercharges surveillance. KASTE: Matt Cagle is with the ACLU, which first noticed Amazon's push to sell facial recognition to police. It's now asking Amazon to stop doing so. While there are other companies that sell facial recognition to law enforcement, he says Amazon is different. CAGLE: Amazon is one of the largest technology companies and one of the largest cloud computing providers. So we find it really difficult to overstate Amazon's ability to influence whether facial recognition becomes widespread in the United States or not. KASTE: In a written statement, Amazon says it, quote, "requires that customers comply with the law and be responsible when using the service." The company also played down just how real time the facial recognition is in Orlando. But for the ACLU, the concern isn't so much about what these systems can do now. It's about what they could grow into. The cloud-based nature of Amazon's service makes it especially easy to expand and adapt facial recognition. Deputy Jeff Talbot is a spokesman for the Washington County Sheriff's Office near Portland, Ore. Deputies there use Amazon to compare photos taken in the field to a database of mug shots. JEFF TALBOT: They've created a little tool where you upload. It sends you your results, and you can continue on with your investigation. KASTE: And this service is astonishingly cheap. TALBOT: We pay literally a couple of dollars a month. KASTE: That kind of automatic mug shot comparison used to require systems that cost tens of thousands of dollars. Facial recognition is now becoming just another digital commodity available to even the most cash-strapped police departments despite the fact that there has been very little public debate about what the rules should be for how police use it. Martin Kaste, NPR News. Transcript provided by NPR, Copyright NPR.